Nissan moved production of the new Micra, shown, to India to cut costs and free UK capacity for pricier vehicles such as the Juke and Qashqai. PARIS (Bloomberg) – Nissan Motor Co.'s European sales expansion may encounter a setback this quarter, after the transfer of Micra small-car production to India created supply shortages, a regional sales executive said. The carmaker halted Micra production in Sunderland, England, in July after building inventory to cover the transition to a revamped model assembled in India. Those stocks were exhausted earlier than expected as European incentives fueled demand for small cars, Boutin said at the regional sales division's headquarters outside Paris. Supplies of the new model won't reach normal levels until March, he said. The loss of market share will be worst in France, the executive predicted. 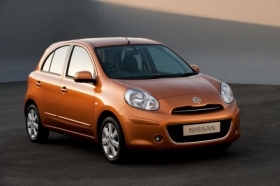 Because of the Micra shortage, Nissan missed out on a December sales surge before the expiry of the country's scrapping bonus, he added. The 500-euro ($650) subsidy continues to apply to 2010 orders delivered by March 31. Nissan, which sold 555,000 vehicles in 2010 in Europe for a 3.1 percent market share, still expects to increase volume in the region for 2011, Boutin said. Other new models, including the Juke mini-crossover introduced in October, will help Nissan buck a European market decline of as much as 2 percent predicted by Renault SA, its French alliance partner and 43 percent shareholder, he added. Since the larger Qashqai's 2007 introduction, Nissan's European strategy has placed more emphasis on crossovers, with the carmaker withdrawing from some mainstream vehicle categories where competition is tougher and margins thinner. The carmaker halted European sales of its Almera mid-sized car the previous year and has refrained from marketing its Tiida compact in most of the region. Pricing for the new Micra, the fourth generation of a model first introduced in 1982, starts at 10,490 euros ($13,770) for the most basic version on sale in France. By transferring production to India, Nissan aims to cut labor costs and share parts with cheaper models for the local market, boosting the return on its research and development investment. The move also frees capacity in Sunderland for pricier vehicles such as the Juke and Qashqai.